Dong Nai (VNS/VNA) - In the southeast region, a curious phenomenon of foreign direct investment firms ‘recommending’ long-time employees to resign has cropped up. In return, these employees receive a hefty one-time payment. The companies don’t force the workers to resign but merely recommend it, and the workers consent, making the practice perfectly legal. However, workers might not be aware that by doing so, they relinquish many of their rights, and some are urging authorities to get involved. Nguyen Thi Sen, 51, from Bien Hoa city of Dong Nai province, worked at Pouchen Vietnam – a manufacturing factory of the Taiwan-based sportswear company – for nearly 18 years. At the end of last year, the company announced that workers with tenure of 15 years or longer may receive a lump sum equal to 12 months of salary if they quit. Sen is still four years from retirement age, and under the company’s policy, she would receive one-month salary as a bonus every year. However, thinking the one-time payment was a generous amount, Sen agreed to end her contract and social security, and received 140 million VND (6,160 USD). Sen said she tried to look for other jobs, but no one would hire someone her age. Nguyen Thi Hue, 47, also from Dong Nai province, worked at Changshin Vietnam for 20 years and earned a basic monthly salary of 9 million VND before ending her contract and receiving 150 million VND (6,600 USD). Afterwards, she intended to find another job but was unable to do so. “I’m currently living off my unemployment insurance but it’s ending soon, now I just want to find a stable job, even 2-3 million VND (88-132 USD) salary a month,” Hue said. According to Pham Van Men, Director of the Dong Nai Social Security, manual labour is a demanding job and workers are exposed to toxins, which gradually damage their health. When workers resign but fail to get another job, without access to health insurance, treatment costs can become a huge burden, Men said. Dang Tuan Tu, Chairman of Changshin Vietnam’s trade union, said the union’s stance remains that the workers should not resign. However, as both parties consent and no disputes arise from these premature resignations, unions cannot intervene. Union representatives said they have tried to persuade workers to keep working until they reach retirement age, showing them the benefits and the downsides of early contract termination. However, it’s not easy to convince workers especially as they don’t fully grasp the government’s insurance policy, they fear that social security premiums will soon soar. Province-wide, in 2016, Dong Nai had 37,000 people registered for one-time insurance payment, while in just the first six months of 2017, the number stood at 27,000. According to the job centre for the Southern region (headquartered in Bien Hoa city, Dong Nai), from May 2017, the number of applicants for unemployment insurance in the province witnessed a worrying jump, standing at 4,000-5,000 people a month, most are long-time workers willingly leaving their companies when the contracts have not expired nor have they reached retirement age. Pouchen Vietnam said while the salary it pays to old workers increases, their productivity remains unchanged, if not lower, hurting profits. With its machine automation plan, the company expects to cut its current staff by 10 percent, or 2,000 workers. The company estimates that in 2017, it will have to dole out 39 billion VND (1.72 million USD) for insurance premium payments for employees. Similarly, Changshin Vietnam, currently employing 26,000 workers, 3,900 of which have worked for the company for more than 15 years, said by the end of May, 440 of these workers resigned and received the one-time payment (a total of 90 billion VND or 3.96 million USD). According to the Management Board of Industrial Parks in Dong Nai province, the premature termination of contracts concerning long-time employees is “a new phenomenon,” and takes place mostly at manual labour factories. Some other companies are considering following suit, including Epic Designers Vietnam Co. Ltd., the Japan-based machine part manufacturer Mitsuba M-tech and the Republic of Korea’s footwear producer Taekwang Vina Industrial, among others. Big companies may be willing to part with large sums of money to oust long-time employees, while other small companies come up with ways to not use old workers. Pham Van Cuong, vice head of the management board, surmised the cause for this phenomenon as the basic salary (per region) increasing annually, in addition to pay rise policies in each company, while the productivity of senior workers does not improve, which makes businesses unwilling to keep long-term employees. 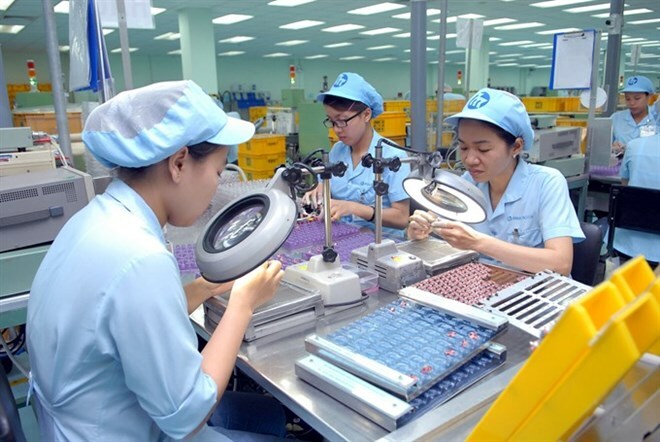 Cuong said that workers with a 15-year tenure and basic monthly salary of 10 million VND (440 USD) and above can have the same productivity as a new employee with starting salary of 4 million VND (176 USD). From 2018, the social insurance premium rate will be calculated based on worker’s gross salary, not the basic salary level, so businesses are worried they will have to a lot of social insurance for long-time workers, cutting into their bottom line. “In addition, manual labour like in textile industry requires little education, the workers just need to be healthy and young, plus, the companies only need to pay a much lower salary compared to senior ones,” Cuong added. Vu Ngoc Ha, Director of the Legal Council for Labour Unions in Dong Nai, said there is little ground for legal intervention for this kind of contract termination at present, but it can’t be sure businesses will not resort to dirty tricks to oust long-time employees.